Vancouver, BC – If there is one day a year that you should see FlyOver Canada, it’s Canada Day! The Ultimate Flying Ride takes guests soaring over the country from east coast to west coast creating an unforgettable sense of pride. 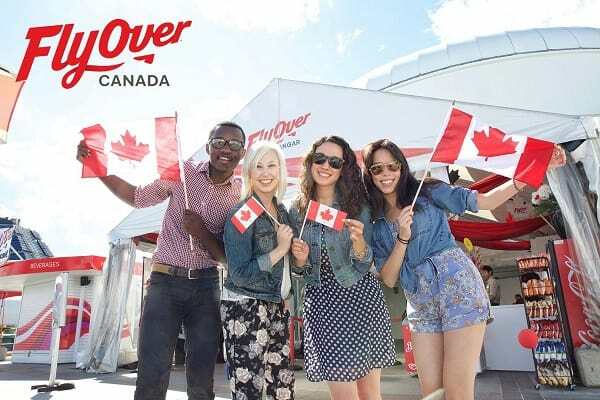 FlyOver Canada is located in the heart of Vancouver’s Canada Day celebrations and is open from 9am to 10pm with rides commencing every 15 minutes. Due to high demand on Canada Day, only FastLane (timed admission) tickets will be accepted to ensure wait times for guests are kept to a minimum. These tickets sell out early so we recommend guests purchase tickets in advance on our website. Visitors and locals alike rate FlyOver Canada as one of the top things to do in Vancouver with many coming out of the ride with a refreshed sense of patriotism. 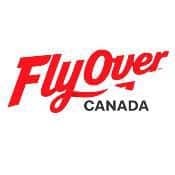 The flight crew at FlyOver Canada will be making this an extra special day for visitors with Canadiana photo props, visits from Canadian characters throughout the day and fun and games for a chance to win prizes. •	Guests of all ages are welcome, however, children must be at least 102cm (40″) to participate in the ride (approximate height of average an 4 year-old). Children 12 and under must be accompanied by an adult or guardian aged 14 years or older. FlyOver® Canada a virtual flight ride that takes guests on a breathtaking aerial tour over some of Canada’s spectacular landscapes using the latest in ride flight technology. Guests sit suspended 10 to 25 feet above the ground in specialized ride vehicles, with their legs dangling, as they move in concert with the film. With the addition of special effects (scent, mist, wind), riders actually feel like they are flying!